Wichita Northwest High School football, led by head football coach Steve Martin, is loaded with star power for the 2018 football season, there’s no questioning it. Martin has put this team on the map of not only the recruiting trail, but now as a team that can contend for a state title. They have Oklahoma defensive end commit Marcus Hicks, Iowa State running back commit Breece Hall and one of the top linebackers in the state over the last couple of seasons in weight room warrior, Josh Carter. It can go even further down the line with guys like speedster Roy Jones Jr. and linebacker Percelle Finch. The Grizzlies go much deeper than those stars and one of those is new to the team this fall. Reagan Jones, the starting quarterback for the Grizzlies in 2018, is in his first year with the program after transferring from Andover Central. Jones, a 6-foot-1, 180-pound, junior, signal caller, transferred to Wichita Northwest from Andover Central where he started as a freshman and sophomore for the Jaguars. 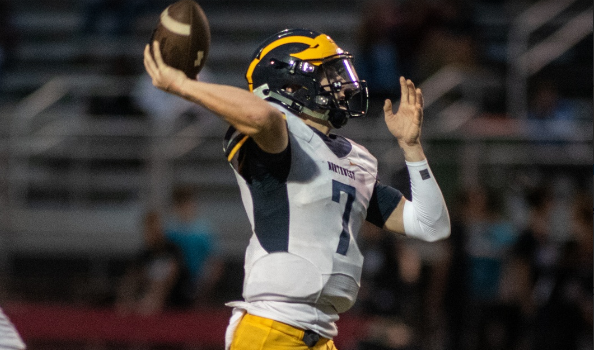 Coming into the year, the missing piece for Northwest seemed to be the quarterback as Austin Anderson graduated after throwing for over 4,300 combined yards the last two seasons in the high power offense of the Grizzlies. So far, Jones has been a perfect fit for the Northwest program at quarterback. He has completed 23 of 39 passes for 350 yards with six touchdowns to just one interception. Jones also has 89 yards on the ground and three more scores. As a sophomore last year, he threw for 1,537 yards in his first year as the full-time starter at Andover Central. He also started two games as a freshman at quarterback and five more at kicker. Jones is coming off a week where he threw for six touchdowns last Friday in the win over Wichita East, 56-0. He also rushed for two scores and threw for 139 more in the 23-22 win over defending 5A champion, Bishop Carroll. Jones spent a lot of the time this off-season focusing on getting better at the quarterback position with his QB coach Steve Cisneros, known in the Wichita area for developing quarterbacks. Cisneros had previously trained Peyton Huslig of Andover Central, a National Champion QB at Garden City, now at Missouri State. He also worked with Korie Frausto of Maize South, one of the top recruits in the state a few years back. Jones also got a lot faster in the off-season, registering a sub 4.5 time in the 40-yard dash after working with his speed coach, Roy Birch. Birch was a free agent with the Dallas Cowboys and his son, Jordan, a star at Andover Central a few years ago, is currently a running back at Illinois State. Jones is not only a rising quarterback talent in the state, he’s also a very good student. He has a 3.7 GPA and Chemistry is his favorite subject. Jones would like to play football at the next level and eventually go into coaching. For now, Jones and his team have their mind on one thing and that’s getting a state championship. “We have a lot of high-profile guys on the team and have the talent to go deep. But we know we have to take it one game at a time. It’s not just high-profile guys on this team either, there are a lot of unsung heroes that make us who we are and it will take all of us to make a run.” Jones said. Wichita Northwest is currently ranked #2 in the all-classes Rack Performance/Sports in Kansas Super 25, only behind 4x 4A-I state champion Bishop Miege (4A). Many 5A polls around the state have the Grizzlies number one and their win over Bishop Carroll helped solidify that to open the 2018 season. Last year the Grizzlies were in 6A and lost to eventual state runner-up Derby in the semifinals. The Grizzlies, led by Steve Martin, will be back in action this week with a huge 5A match-up at home with Great Bend (2-0). We caught up with the rising junior quarterback below in the latest Q&A edition of Faces in Kansas. Birch Performance is a proud supporter of Wichtia area athletics. Best of luck to Wichita Northwest and quarterback Reagan Jones. Visit us online here. QB Rising - Steve Cisneros - A Football Revolution - is proud to support Reagan Jones. Best of luck in 2018! Linda Gregory Photography. Proud to support the Wichita Northwest Grizzlies. Visit us online at www.lindagregory.com. I begged my parents to let me play in second grade. They didn’t have a second grade team in my town so I had to go to Rose Hill to play. It was a great experience and I made several friends. Third grade year I was able to play with a team in Andover. We were the Andover Jets and had a 38-1-1 record over four years winning the Crowder Bowl the last three season and I was a three-time MVP. Looking to perform as the team’s QB with greater than a 65% completion rate, 2000+ yards passing, 500+ yards rushing, and to compete for the 5A state championship. I believe we do. We several high profile players on the team and lots of other unsung heroes that are determined to get to the championship. Of course, we only take it one game at a time. I’m only as good as the players around me. It takes eleven of us each doing our job to the whistle to be successful. From a personal standpoint, I’ve worked very hard since the second grade to become the best QB possible. I’ve spent numerous hours during the off-season getting ready for this opportunity. What’s the atmosphere like to play football on Friday night for your school and town? It’s electric – almost surreal. The fans are awesome and they make the each game a great event. We have a high-powered offense. Coach Martin does a great job of designing a game plan that is both effective and yet fun to watch. We have guys making plays all over the field on both offense and defense. It is never boring!! Breece Hall – an Iowa State commit and the best running back in KS. Marcus Hicks – an OK Univ (OU) commit and the best DE in KS. Josh Carter – the best middle LB in KS. Roy Johnson – an explosive, fast utility back that can do it all. Percelle Finch – one of the best OLB’s in KS. Kale Patterson and Zion Jones are two of the best receivers in KS – they will climb the ladder for the ball. Of course, all of our players are dynamic – just look at our roster and you’ll see a collection of superior football players – I wish I could list them all here. Friday Night Lights – it’s all about the experience. We all work hard to excel under the lights. It’s a brotherhood, we take the field together with a common goal – to win. Do you play any other sports, tell us about that? I’ve played several sports over the years. As I’ve gotten into high school, I’ve limited it to football and basketball since I spend much of the off season working with my QB coach, Steve Cisneros, and my speed coach, Roy Birch. Prior to high school, I wrestled for two seasons and played baseball for at five seasons. It is a dream come true. He is a great guy on and off of the field. He is a tremendous leader and would do anything for his players. He always gives us his best and expects that we do the same. He is very high energy and never seems to run out of gas. He is a tremendous role model. We hit the weight room hard. We believe that our conditioning and strength will make the difference. We also do team-building events like our Tulsa Camp. I had several camp invitations this summer. Additionally, I have several coaches following me on twitter as well as receiving requests for me to complete recruiting questionnaires. I plan to continue to work hard hoping to get noticed so I can hopefully play at the highest level. I like fishing – it is a nice break from the chaos. Spending time with my family and hanging out with my girlfriend. If I’m not playing, I hope to be coaching college football. I love the game and can’t imagine doing anything else. I like science the best – chemistry is my favorite and labs are fun. I’m a good student with a 3.7 GPA. My dad is my role model. He has worked tremendously hard over the years to provide for our family. I hope to follow his example and do the same for my kids someday. I love Slim Chickens. I stop by there every chance I get. I’m actually kind of shy. I’m in my element on the football field, but not so much in a crowd. I am a person of faith and thank God for the talents he has given me. I believe it is important to give Him the glory.